Enter DbClone URL e.g. 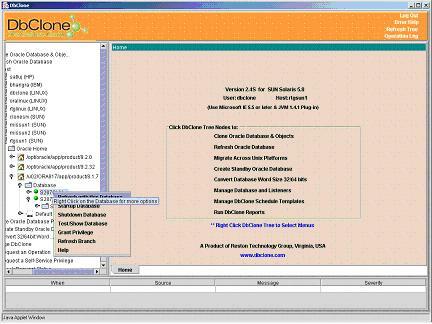 http://64.83.45.3:5555/Cloneie.html and login to DbClone login-applet to start DbClone Console. 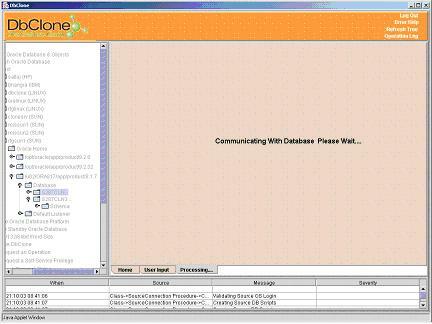 DbClone Console provides links to Logout, Error Help, Refresh Tree and Operation Log to help the user in operation on top right corner. 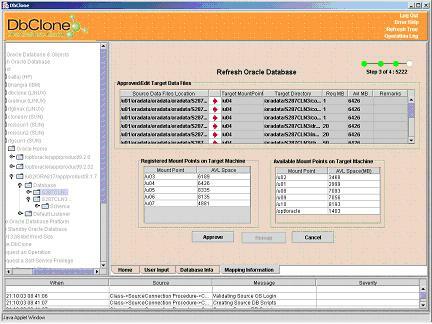 The Left part of DbClone console is navigation tree that provides detail hierarchy Hosts oracle Homes and database with in branches like Clone Oracle Oracle Database & Objects, Refresh Oracle Database, Migrate Oracle Database Platform, Create Stand-by Oracle Database, Convert 32/64 bit word size, Manage DbClone, Manage Database/Listener, Manage Scheduler Templates, DbClone Reports. Tree structure changes according to the privileges given to user. 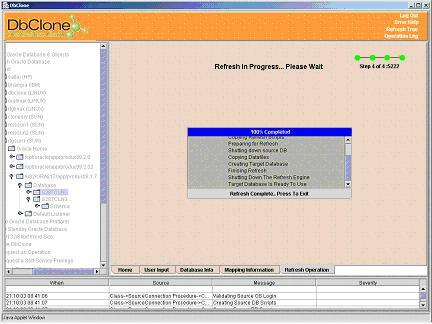 DbClone Console Central window is work area for operational inputs and wizard like operations. 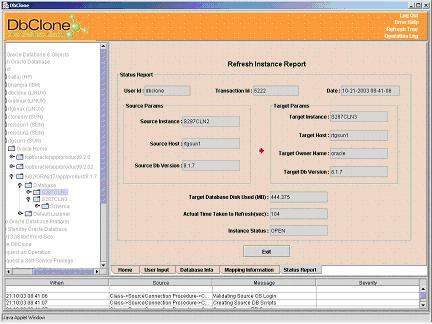 Screen shots of the Dbclone console are available on his page. Databases registered with DbClone can be refresh by few mouse clicks by selecting a source a Host, Oracle home and a Database on the tree and then selecting a matching Host, Oracle Home and entering the Target Database on the Central Window of DbClone. Proceed and cancel buttons are provided to navigate between the Central Windows shown below. 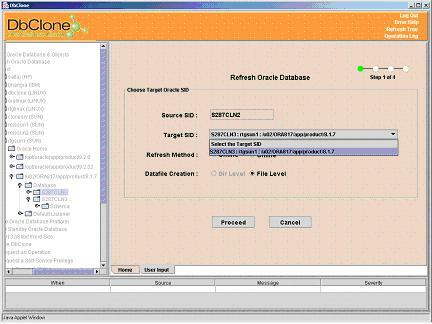 Dbclone Console uses Left mouse click to open a tree nodes and right click for selecting an operation. Operations such as Cloning/Refresh/Migrating are performed by selecting the corresponding node in the tree shown on the left panel of console. Expand each node to select the desired operation. 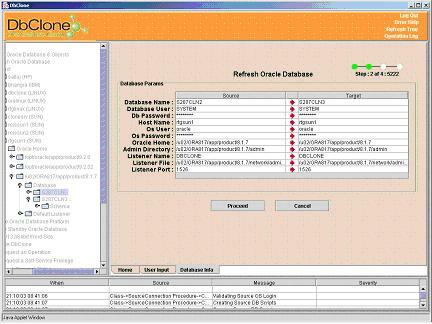 For example to refresh a database as shown in the console picture "REFRESH’ under oracle home /opt/d09/ORA816/app/oracle/8.1.6 on server “rtgsun1”, navigate the tree starting with “Refresh Oracle Database” node until the source database is located. Click on the source database “REFRESH” to start the cloning process. You will be asked to select the target oracle home into which you want to refresh the database, enter the target database SID, select the refresh method (online/offline) and refresh level (directory/file). Click on Proceed button to go the next step. 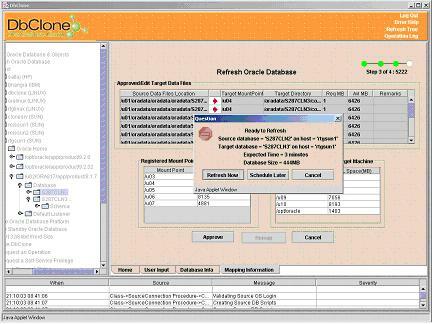 The second step displays information about the source and target database. If the information displayed is correct, click on Proceed button to continue or Cancel button to modify/abort the process. This step shows the location of source data files, suggested location of target data files, required disk space and available disk space on target host. Location of target data files can be changed, if required. Click on Approve to continue or click on cancel button to go back. 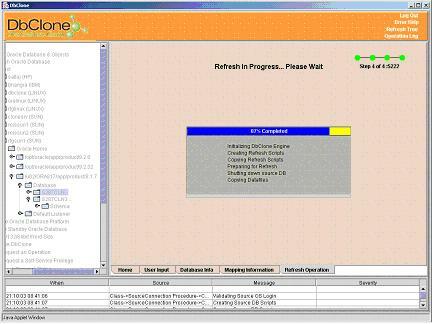 The ready to Refresh message allows to start the cloning right away or schedule the cloning for later time. The last step shows the status of Cloning process in a progress bar and the steps performed sequentially. If there is any error it shows in a table at the bottom of the screen. on successful completion of the operation a summery one page report is presented. Click on the exit button to see the newly refreshed database in the tree.